Touche Amanda! I have to admit that the general lack of empathy is one thing in which Singapore has little to be proud of. And hey, how’s this to top it all off – the Ministry of Foreign Affairs has just appointed an special ambassador to oversee the relief support that Singapore is providing to Japan! I think Singapore is getting a bad reputation here. Singaporeans have donated generously to other calamities in the past like the tsunami in 2004, earthquake in Pakistan. Singaporeans do help people in need! Trust me, I have had family members and friends who spent months working in Pakistan, Acheh, Sri Lanka. As to spending money on casinos and other places, I really don’t see the logic of linking that to empathy for Japan. If that is the case, casinos should stop operating in Macau, Australia, America etc. People spend money where they want to. It would nice if everyone thinks alike and donate every dime to the victims in Japan. Unfortunately, that is not how humans, be it Singaporeans, Americans, Germans, Chinese, Indians think. It has always been that way, and, it will always be that way. Don’t start pointing fingers at Singaporeans. As to being rude in the trains, I don’t see how we are any less rude than passengers, say in New York, or, other places. I thought visitors to this country would be impressed by the cleanliness of the train stations, its punctuality etc. Apparently, I am mistaken. If the Singapore government appoints a special ambassador for the Japan relief effort, there is more to it that just trying to safeguard the sum that the government is providing to Japan. It is also about ensuring the well-being of Singaporeans there, acting as a conduit between expatriate Japanese in Singapore,and, to provide other assistance. The Singapore Civil Defence, I am sure, will respond to the needs and requests of the Janapnese government. We have done so in the past for other countries, and, we will continue to do so. Rushing headlessly into any disaster zone is foolhardy, perpetuating an already difficult situation. I am confident that the Singapore government would have already asked the Japanese government for its needs, and, would be acting accordingly. When people step into other countries to work, they engage in community efforts to do their bit for the host country to show their appreciation for the hospitality shown, and opportunities given. I like to believe foreigners who come here also engage in such activities for similar reasons. Do not use the ang mo social/community activities to smear Singaporeans. We are not perfect, and so are you! If you have a different set of beliefs to us, so be it. We don’t need to follow your example to get your favourable opinion. I have always believed that people come here for the opportunities, and, for the safe environment. But, when people start having a condescending attitude like this, t is better that they don’t come. Surely, it will save them some rude experiences. Not to mention, staying put in their supposed oasis in their home country. But no, they wil lcontinue to stay. Why? because of the opportunities. They are not here because of humanitarian reasons, but, purely for economic reasons. Do take note of your own selfish reasons because you point out to us. By the way, local organizations like Mercy Relief, Lien Aid etc do engage in humanitarian efforts in neighbouring countries. And, the Singapore government does have training programs for sharing its public administration knowledge for civil servants from poor/developing countries. We do our part. That you are ignorant of it is no excuse to lambast Singapore. Are there many fundraising campaigns/non-profits that would collect relief funds in Singapore? It doesn’t excuse the lack of generosity, but consider that in the U.S. we are used to fundraising campaigns and have a fundraising infrastructure in place which includes email campaigns, ads, phone calls etc. Farmville is a great example of the level at which our culture values giving and of how innovative our fundraising has become. Without that efficient system or the media covering the tsunami I wonder if we or other nations would be able to raise so much money from the private sector. I am not sure I understand Ellen’s Comment. In no disrespectful way. Singapore is a modern affluent multi cultural City.It is a heck of a lot closer to Japan than the US is not just geographically but socially. The people and cultures are similar. Believe me there are enough Singaporian office workers playing Farmvilla to get it. There are a lot of efforts being made within my company and many others to raise funds for Disaster relief. It was personal for a lot of us. We have a lot of colleagues and good friends that were in Japan at the time and continue to send us updates. In the last week I have had to study the effects of a Nuclear melt down in Japan to understand what the environmental impact to our operations in Singapore would be, not out of fear mongering but out of a need to protect our staff. This is VERY real for those of us here regardless of where you come form. Singapore unfortunately for the most part is empathetic to others. I do not believe this is a case of having enough exposure to fund raising. This goes far beyond the realm of creative fund raising. I challenge anyone to look at the image from Reuters that can be found on MSNBC photo of the week page. 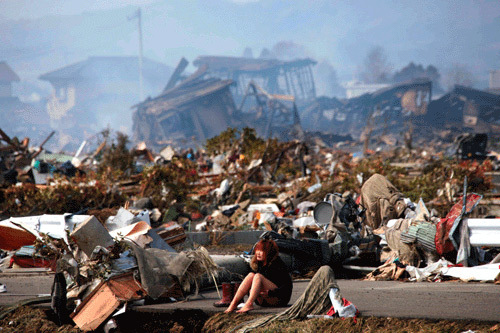 The girl sat in the destruction crying. Look at that and tell me there is no emotional attachment. As far as News is concerned it has lead every aper and been 24 hour coverage on most news channels here. My understanding was that Japan doesn’t actually need financial help right now, and that US organizations are kind of exploiting the crisis to raise money that isn’t needed. Chris — Hmmm…sounds like a VERY special job that someone got (who knew someone, I bet). Bet it lasts longer than the needed too. Peter — There are a lot of very good things about Singapore and I’ve sung its praises here and in personal conversation. There are a lot of negatives too — Singaporean’s general lack of empathy and self-centeredness are a couple of them. The astonishing amounts thrown away on gambling (as opposed to doing something useful with that money) are a symptom of the problem as well. Singapore is a wealthy nation, no matter how you measure wealth. There is much good it could do in many situations. Often, it hasn’t even made basic local progress (such as rights for handicapped people) that one would expect of such an advanced nation. As for the rest, I’ll just leave it here. Ellen — I don’t know. They often have local-issue donation collectors out on the streets, however, they tend to target Westerners and leave the locals alone (I’ve observed this countless times). I don’t know about any infrastructure set up to handle large-scale donations, most likely because Singaporeans aren’t in the habit of making charitable donations in the first place. Former Aussie Flatmate — Thank for you the inside look at what it’s like in Singapore right now, as well as how your colleagues are doing in Japan. Ramble on as much as you like! I assume many companies in Singapore have colleagues in Japan — is this prompting generous efforts or just a lot of Facebooking? You’re ignoring K-Pop? But, it’s the ultimate expression in annoying, musical teenaged-slobber! Anyway, I think, from what you said in your post, the Singaporean government seems to be the assholes more than the people. But regardless, I’m sure the government could have done more. As the world slides from one natural disaster to the other, and from one war to the next the policitians lose focus on what there role is as their nations leaders, to support there own countries but to support there fellow human beens that are in crisis as well. The world in todays terms is a small place and every human been should be a brother and sister to us all. Aspasia — Oh god yes I’m ignoring it!!!! I’ve read online interviews with a few of them and I think I lost precious brain cells because of it. The people can be assholes just fine on their own too. In this case, the government’s paltry donation of $500,000SGD is hugely laughable. Aussie Friend — What a lovely statement. YES! KLG — Thanks for the link. This still doesn’t excuse Singapore’s general lack of charity. Much better to offer and be turned away, than not bother much at all (in a case like this). And I’m wondering if the US can take some classes from the Japanese because there will be a Katrina II somewhere along the US coast. Given the recent major earthquakes along the Pacific Rim, the West Coast should be on alert right now. When are you going to write an international guide, Amanda? Tara — I’ve written better bits about Singapore, if you search around on here. Just some historical perspective…Singapore was occupied by the Japanese during WWII and the people here were literally abused by the Japanese. Lots of people here still remember. Browsing — Yes, I know this. I talked to people who were there, actually. But if the Japanese can get over what we did to them, the Singaporeans can get over the Japanese invasion. The point I was trying to make didn’t became clear to me till about a week after I’d posted this. Give the average Singaporean $100K and tell them they cannot keep it: they can either give it all to charity or blow it at the casino and before you finish the question they’ll be on the next free casino shuttle bus. Ask the average American the same question and they’ll very likely make a donation and probably wish to make donations to several groups they support.